Brunello di Montalcino is a robust Italian red wine grape produced in vineyards in and around the town of Montalcino, about 120 km south of Florence in Tuscany. The word Brunello is derived from the Italian masculine form Bruno, which means “brown.” You’ll find my top 10 Brunello di Montalcino reviews and ratings here. 1. 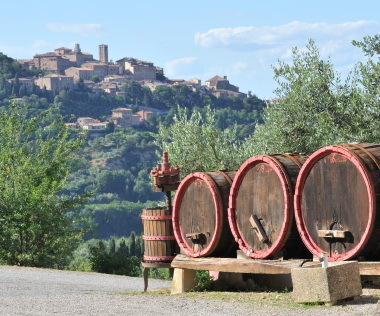 The origins of Brunello di Montalcino can be traced back as far as the 14th century. A red wine praised by the nobles of Tuscany as the “best wine in Tuscany,” Brunello is considered the youngest of Italy’s prestigious wines. 2. Brunello di Montalcino is often compared to Burgundian Pinot Noir. Smooth tannins, acidic, and ripe fruit driven character. 3. Originally, in Montalcino, it was believed that Brunello was a single individual grape grown just in that region. Extensive study was done in 1879 by the Province of Siena’s Amphelographic Commission and concluded that it was in fact a particular clone of the Sangiovese grape. In 1888, Ferruccio Biondi-Santi bottled and formally named the first Brunello di Montalcino. Biondi-Santi is also credited with isolating the superior Sangiovese clone found only in the Montalcino wine region. 4. By WW II, Brunello developed a reputation for being one of Italy’s rarest and most expensive wines. More producers wanted in on the action. By 1960 there were 11 producers following Biondi-Santi’s success. Brunello evolved into a designation of wines made with 100% Sangiovese grapes. In 1968, Brunello di Montalcino is awarded DOC status. 5. By 1980, there are 53 Brunello di Montalcino producers and the wine was awarded the higher level DOCG status. Today, there are 200 producers of Brunello di Montalcino in Italy and it remains one of Italy’s best known and most expensive wines. Climate has the most influence on the deep characteristics of Brunello di Montalcino. Montalcino sits south of Florence and enjoys warmer, drier growing seasons than that of the other popular Tuscan Sangiovese region Chianti. It is the driest of all Tuscan DOCG zones. Cool, south-west maritime breezes also help ventilate late afternoon warmth and bring cooler nights. Sunshine on the northern and southern facing slopes are used to full advantage creating earlier or later ripening as desired. The particular isolated superior Sangiovese clone unique to Montalcino region imparts distinct characteristics in Brunello di Montalcino. Aromas include blackberry, black cherry, black raspberry, leather, chocolate and violets. Perhaps fleshier in taste than Chianti. Brunello di Montalcino producers divide their production into two categories: normale or riserva. By DOCG law, Brunello di Montalcino must be aged longer than the majority of Italian wines. Normale requires 4 years, two of which must be in oak. Five years of aging are required for riserva Brunello di Montalcino, 2.5 years of which must be in oak. The kinds of oak varies. Traditionalists will use the large old Slovanian oak casks that don’t impart significant character to the wine. Modern producers will use smaller French barriques that give more structure and vanilla, but require some management of overwhelming characteristics of oak and vanilla by the winemaker. Fun fact: 1 out of 3 bottles of wine sold in the United States is Brunello di Montalcino, mostly in restaurants. Brunello di Montalcino food pairing with grilled meats and game. When you join our wine community as a Paid Member, you’ll get access to all of my Brunello di Montalcino wine reviews, which are updated weekly.